Comedian. Actor. Dog Walker. Parent. Sometimes on your telly, never on your drive. Has own teeth and is left-handed. Veggie. As seen on Live At The Apollo, Peter Kay’s Phoenix Nights, 8 Out of 10 Cats, Alan Davies: As Yet Untitled and Coronation Street. Series regular on The Premier League Show and 5Live's Fighting Talk. His comedy has taken him on tour to Australia, China, Japan and the Middle East. 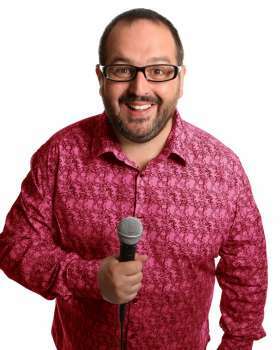 He has performed stand up comedy on television a number of times including, several series of The Comedy Store (Comedy Central), One Night Stand (Dave) and was Michael McIntyre’s guest on his Blackpool leg ofComedy Roadshow (BBC1). Other TV/ Film credits include; Alan Davies: As Yet Untitled, Ken Loach’s Looking for Eric, Max and Paddy’s Road To No-Where, Shameless, and he was a winner of Celebrity Mastermind. Justin was a regular presenter on Key 103 for over a decade and is still very active on radio. He’s written and starred in two series of his own Radio 4 sitcom Everyone Quite Likes Justin and often pops up on The News Quiz on Radio 4, and TalkSPORT, as well as contributing regularly to both Shaun Keaveny’s breakfast show and Radcliffe and Maconie in the afternoons both on 6 Music. Justin regularly performs at private and corporate events, including company awards, AGMs, Christmas/ end of year parties, weddings and birthdays. He is available for both after dinner comedy sets and as a host. Justin is particularly in demand as an awards host, his cheeky, irreverent yet professional approach proving a popular fit for bookers and audiences all over the UK and internationally.